Olive Oil, Fresh Mozzarella, Garlic, Fresh Basil and Tomato. ST. JOSEPH – The Fire & Ice Pizzeria & Creamery in Royalton Township has begun to draw a following, just weeks after opening. The restaurant serves wood-fired pizzas from a special oven and makes its ice cream using liquid nitrogen tanks at its 3848 Niles Road location. Owner and operator Lori Costanza said the idea came about when she and her family went to Florida in January on their vacation. There, they came across the Abracadabra Ice Cream Factory, which used the same liquid nitrogen ice cream concept. Using nitrogen that reaches temperatures as low as 328 degrees below zero, Costanza said they take fresh cream and add different flavors to it along with other toppings before flash freezing it. Business hours have changed since the pizzeria and creamery opened at the end of June, but for now they are 11 a.m.-10 p.m., Monday through Friday, 4-10 p.m. Saturday and noon-10 p.m. Sunday. The business’ logo depicts the ice cream scoop and a pizza wheel, something Costanza said was the most relevant to what they sold. The menu has been expanded, as salads have been added, with soup and sandwiches on the horizon. While Costanza’s husband is a farmer and she works as a nurse, they rely on their 20 employees, which includes their two 18-year-old daughters. Daughter Anya Costanza said she liked the idea of the ice cream when she first saw it in Florida. Costanza said the family went back to Florida a month later in February, where they trained at Abracadabra for a week. Once Costanza put an offer into a building, they got in touch with Tim Mammina to develop the pizzas. Having eaten at his former St. Joseph restaurant called Mammina’s at Edgewater, the two started talking and soon Mammina was recruited to be the pizzeria’s chef. After closing on the building in March, the next three months were dedicated to renovation. This included seating, the stove and nitrous tanks as well as a sports court – with shuffle board, a playhouse and other game tables for children. The concept was to have a place where kids would want to come and parents could get good food. As a mother of five, Costanza had the playroom in mind. When Lori & Todd Costanza spent their family vacation down south over the holidays they discovered a magical ice cream place in Kissimmee called, appropriately, Abracadabra. At the Abracadbra Ice Cream Factory, they employ one of the hottest new trends in ice cream delivery in the nation…and soon the Costanza family will do that in South St. Joseph. At Abracadbra, they use liquid nitrogen to freeze your ice cream creation within seconds. Utilizing temperatures that reach 328-degrees below zero, the ice cream is flash frozen right before your eyes, sending up a misty fog as if by magic. The Costanzas were so enamored by the concept they went back a second time and found the place packed again. They literally couldn’t stop thinking about it and how cool (pun fully intended) it would be to have their own place. They immediately began researching the idea and searching for a family-friendly place for their new restaurant here in Michigan’s Great Southwest. Lori e-mailed the owner of Abracadabra seeking help in starting a place of her own here at home. The Costanzas actually went back to Florida for a week last month to work in his restaurant and learn the concept. Todd, Lori and their two teenaged daughters all trained in the concept and are ready to perform their ice cream magic for the rest of us. 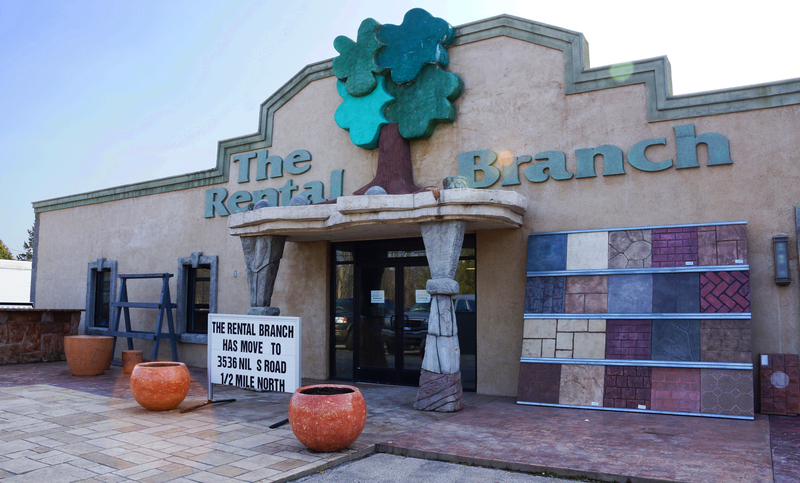 Last week the couple negotiated a deal with Mike Branch of The Rental Branch to buy his former decorative concrete showroom at 3848 Niles Road in St. Joseph for their new venture. MIke had consolidated his business closer to I-94 at 3536 Niles Road, and was ecstatic to find buyers who will be able to capitalize on the very colorful work he assembled in his former showroom. Meanwhile, the Costanzas were equally delighted to find a place that will be easily adaptable for their eclectic approach to the business. It’s already a very eye-popping place and will come alive with the new decor underway right now. Fire & Ice Pizzeria & Creamery will employ the liquid nitrogen flash freeze methodology for ice cream with lots of flavors and toppings, and they will employ the woodfire pizza methodology for great new pizzas they are currently working with a chef to design for their upcoming menu. There will be lots of family fun amid the pizzas and ice cream with an indoor sport court of either soccer or floor hockey, an indoor playhouse and sandbox, and other features being finalized but not solidified yet such as a ball pit or bounce houses and the like. The Costanzas two 17-year old daughters will be working there and potentially running the place eventually, and Todd & Lori will share administrative and management responsbilities while continuing to maintain their individual jobs on the local front. Lori owns and operates Private Duty Home Healthcare, also on Niles but closer to town, alongside The Neon Grill. Todd works for the family farm, Russell Costanza Farms of Sodus, which is a major provider of produce to Meijer, routinely shipping thousands of pounds of fresh produce to the supermarket giant. Fire & Ice will have about 14 round tables scattered throughout the large space as well as multiple picnic tables near the sport court and play house. Mike Branch’s concrete experts are putting the finishing touches on a separate party room that can be reserved for private events. Lori tells me that she wants Fire & Ice to be the place that has something for everybody including being a win-win for kids and adults alike. If everything moves along at the current pace, Lori is hopeful to have Fire & Ice open for business on Memorial Day weekend, but that’s a tight timeframe and could change. I’ll keep you posted going forward. The picture here shows the former Rental Branch building being converted to Fire & Ice Pizzeria & Ice Cream.